The most important structural feature of the neoliberal order has been the persistence of global imbalances. Chronic trade deficits of the United States have been matched by equally persistent surpluses of fast-growing Asian economies and oil exporters. Alongside, there has been an explosion in US public and private sector debt, which has its counterpart in the savings and mounting dollar reserves of manufacturing powerhouses of the Pacific rim and primary resource exporters of west Asia. Once inflation had been tamed in the early 1980s, it has remained at very low levels. On the other hand, asset prices have taken off. Furthermore, the intensity and frequency of asset price bubbles has been unprecedented. In this essay, I will try to show how these developments came about historically and stem from the political economy of the US state. 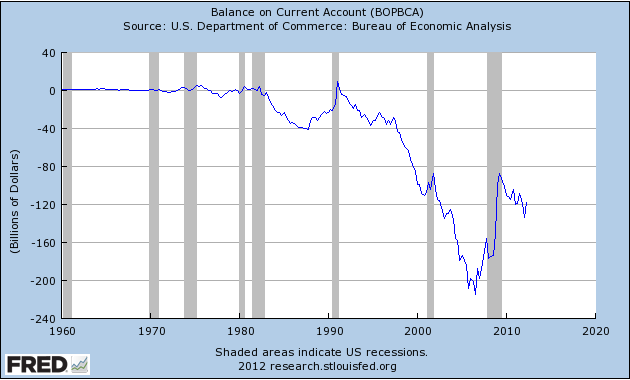 The trade deficit of the US is really hard to miss. Deficits began growing in earnest after the recession ended in 1982 and have shown no signs of abating. These have been financed by capital inflows from overseas. See charts below. 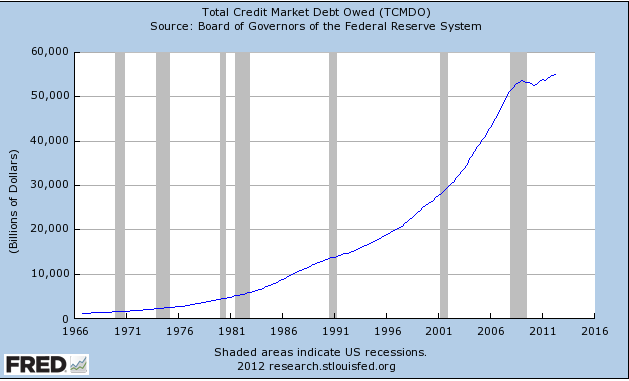 The explosion in debt has been truly astounding. The following chart shows the growth in total public and private debt. 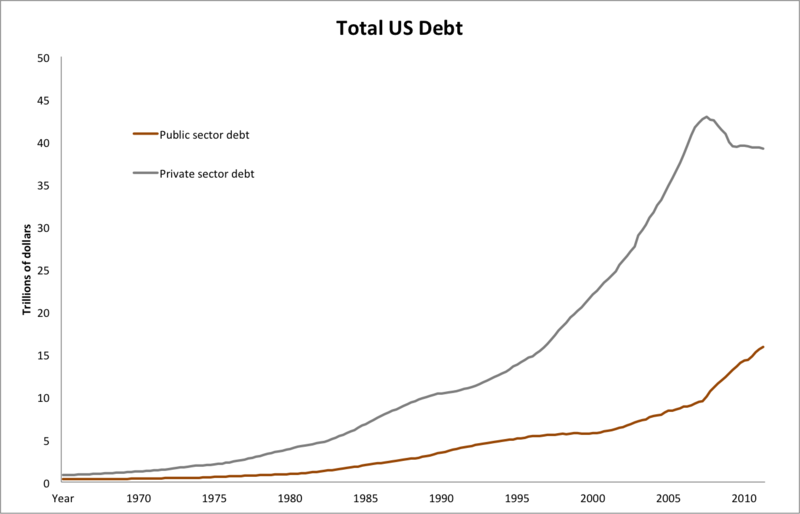 Having crossed one trillion dollars for the first time in 1964, total US public and private sector debt surpassed $4 trillion in 1979, then ballooned to over $10 trillion in 1987, $20 trillion in 1997, $40 trillion in 2005, reaching a mind boggling $55 trillion by the second quarter of 2012. The explosion in asset prices has been even more remarkable. 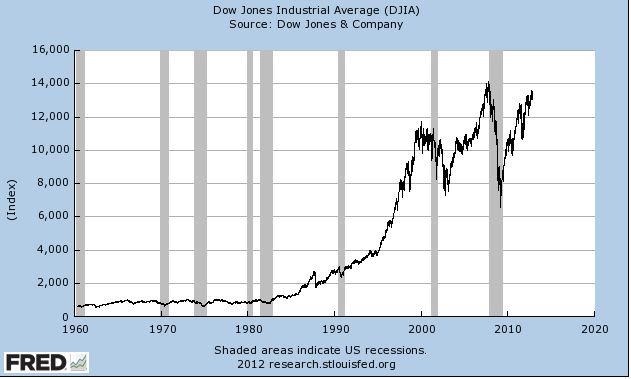 The Dow Jones was fairly tame in the post-war period, going up and down with the business cycle but staying between 500 and 1000 between 1958 and 1982. Then it took off into the stratosphere (see chart below). Similarly, real estate inflation has been fairly mild in the post-war period. 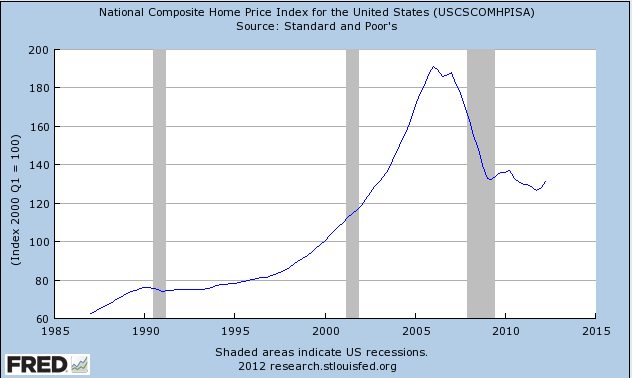 House prices, for instance, started their upward trajectory in 1997. Ten years later, single family dwellings in the United States were twice as expensive. The American middle class has seen stagnant incomes for the past thirty years. After having grown steadily in the early post-war period, US real median household income had reached $47,563 in 1973 (measured in 2011 dollars). In 1979, it was virtually unchanged at $47,527. Then it declined for 5 straight years to hit $44,823 in 1983, a decline of 5.8 per cent over the decade. In the late 1980s, it finally started increasing steadily again, rising for six straight years to $50,624 in 1989. Declined again for four years to $47,884 in 1993, essentially wiping out the meagre gains of the past twenty years. In the mid to late 1990s Clinton boom, it rose steadily for six straight years, finally reaching $54,932 in 1999. In the entire 12 year period from 2000-2011, it only grew for 3 years (2005-07), declining first to $52,788 by 2004, and then growing to $54,849 in 2007. Since the start of the Great recession in 2008, it has declined steadily to $50,054 in 2011. Note that this is actually lower than what it was in 1989, and a whopping 5 per cent more than it was a forty years ago. The bottomline is that most American households have not seen a rise in their standard of living in a generation. 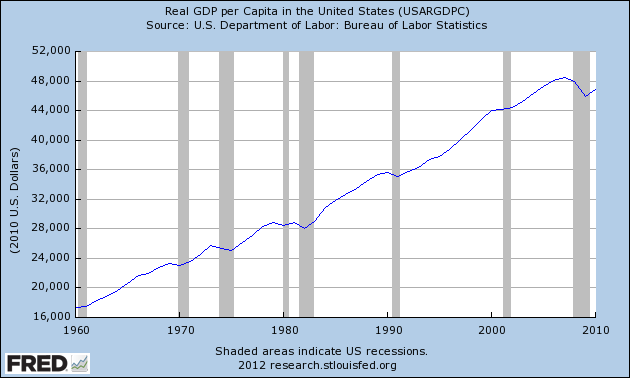 Meanwhile, both US GDP and personal income have grown steadily in real terms. This divergence between median incomes and per capita income is further evidence, if any more was needed, that the benefits of growth in the neoliberal era have been concentrated at the top. Indeed, the share of the top 1 per cent has grown from 9 per cent in 1976 to 24 per cent in 2007. In the same period, the share of the top 10 per cent has grown from 33 per cent to 50 per cent, while that of the bottom 80 per cent has declined from 57 per cent in 1969 to 49 per cent in 2011. During the post-war period, recoveries from recessions were rapid. On average, output recovered to pre-recession levels within two quarters, and jobs recovered in 8 months after the recession trough. 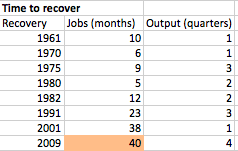 From the 1991 recession, output recovered in 9 months but the economy failed to recover jobs for 23 months. The 2001 recession was when the phase “jobless recovery” was first used. Output recovered within a quarter but jobs did not recover for 38 months. The Great recession ended in June 2009 when GDP started growing again, regaining the 2008 second quarter peak within a year. It has been 40 months since the trough, and jobs have yet to recover. Rampant inflation during the stagflation crisis undermined this system completely and led to pressures for deregulation from interest groups and the public alike. This led to the Depository Institutions Deregulation and Monetary Control Act of 1980 signed into law by Carter, which deregulated interest rates. Financial innovation, specifically the development of interest rates swaps and currency derivatives, was a direct response to these developments. (It was not finance but nonfinancial firms that clamoured for protection in a regime of volatile interest and exchange rates.) Nonfinancial corporations reoriented themselves towards the financial markets in what amounted to a ‘Copernican revolution’. 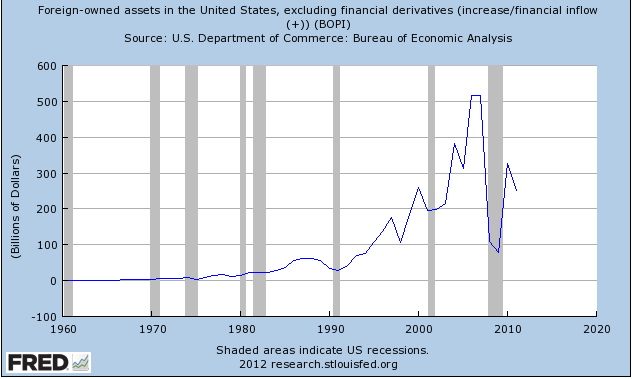 [Davis] The financial sector itself went through a radical overhaul. The fragmentation of the financial sector that was characteristic of the New Deal era was eventually replaced by the rise of financial supermarkets, especially after the “Citigroup legislation” that repealed the Glass-Steagall Act which had separated commercial and investment banking. These developments led to an unanticipated explosion of private sector credit and financialization. Furthermore, with the dollar still acting as the reserve currency, the expansion of export-led Asian economies required persistent US deficits to expand the monetary base of international trade. Since most of international trade is settled in US dollars, growth in international trade virtually requires a constant increase in the amount of dollars in international circulation, and hence, a trade deficit in the US. [Triffin] This has enabled the US state to finance unprecedented deficits by inflows of foreign capital. The fact that recoveries have been jobless puts enormous pressure on policymakers to keep applying stimulus to the economy in an effort to generate jobs. [Rajan] This implies both that public deficits persist and grow, and that interest rates are kept low for prolonged periods. Ultra-low interest rates propel asset price bubbles as investors flee from treasuries to anywhere they can find positive returns: equities, emerging markets, real estate, and junk bonds. In fact, it was precisely the failure of the Federal reserve to tighten monetary policy in the late 1990s that led to the excesses of the tech mania. After that bubble burst in March 2000, the Fed cut interest rate down to zero and kept it there for years. This almost immediately created a bubble in real-estate with familiar outcomes. When asset prices rise, it stimulates the real economy through a “wealth effect”. That is, households and firms holding these assets see their paper wealth go up and increase consumption and investment spending. In fact, this was the economic rationale for Bush’s “ownership society” initiative and the expansion of mortgage lending by “innovative new private sector products and services”. However, unlike booms driven by growth in productivity and profitability, the “wealth effect” quickly goes into reverse when asset prices collapse. Faced with diminished net worth, firms and households cut spending to repair their balance sheets, leading to a “reverse wealth effect”. Moreover, ultra-low interest rates mean that capital is super cheap, which drives firms toward labor-saving innovations and increasing capital intensity. This makes recoveries even more jobless than they would otherwise have been due to rising worker insecurity which makes workers willing to work longer hours for the same pay. What we are observing is the emergence of a two-tier structure in the US economy, with divergent fortunes for the two strata. This is a structural outcome of finance-led neoliberal globalization. The politics of the US state exacerbate the inequities and distortions of this system leading to booms in asset prices, rising private sector credit, trade and public sector deficits; all the while failing to solve the underlying problem. Rising asset prices largely boost the fortunes of the already wealthy (the top 0.1 per cent take half of all capital gains), even as the “wealth effect” fails to create sustainable jobs and raise the living standards of the majority of the populace. Neither the Democrats nor the Republicans have anything in their policy platforms to address these fundamental issues. The commitment to finance-led neoliberal globalization is based on a bipartisan consensus, being an invariant of the ‘system of 1980’ per the investment theory of party competition. [Ferguson] In this sense, the election next week is almost irrelevant and you can vote for whoever appeals to you on gay rights and abortion. Given how Obama’s election demobilized the left and those pushing for fundamental change, the Policy Tensor is rooting for a Romney victory. Perhaps an intensification of neoliberalism is precisely what is required to build the political momentum to kill it. Brenner, Robert. The Boom and the Bubble: The U.S. in the World Economy. London: Verso, 2002. Print. Krippner, Greta R. Capitalizing on Crisis: The Political Origins of the Rise of Finance. Cambridge, MA: Harvard UP, 2011. Print. Rajan, Raghuram. Fault Lines: How Hidden Fractures Still Threaten the World Economy. Princeton: Princeton UP, 2010. Print. Triffin, Robert. Gold and the Dollar Crisis; the Future of Convertibility. New Haven: Yale UP, 1961. Print. Davis, Gerald F. Managed by the Markets: How Finance Reshaped America. Oxford: Oxford UP, 2009. Print. Ferguson, Thomas. Golden Rule: The Investment Theory of Party Competition and the Logic of Money-driven Political Systems. Chicago: University of Chicago, 1995. Print.